Before he became world-renowned as Dr. Seuss for his children’s books and illustrations, Theodor Geisel worked for the US government during World War II designing posters such as this one, encouraging patriotism and investment. 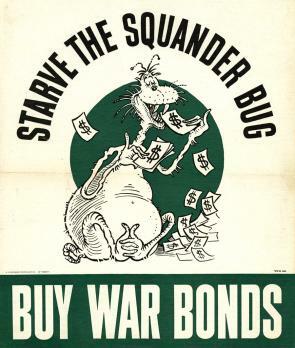 The Squander Bug character first appeared in British World War II propaganda to discourage careless spending. American posters, like this one, encouraged citizens to spend their money on war bonds to help fund the war effort. Bonds issued by the government helped finance military expenses and were also a way to remove money from circulation to help control inflation. A) Define the word, “squander.” B) In the context of this cartoon, what other word might be a synonym for squander? Explain the objectives of this poster. According to the cartoon image, what actions would help to “starve the squander bug”? Why did the government use cartoons like this one to convey important messages to the American people?